Aging is inevitable. But Prematured Aging is NOT. Premature aging is a degenerative cellular response to a culmination of various factors including unhealthy diet, work stress, lack of exercises and environmental pollution. Celergen helps you arrest aging significantly. The cell is where all degenerative diseases start. People are wisening up. They choose prevention over treating symptoms. And the best strategy against degenerative illness is to ensure that body cells are functioning and regenerating healthily. CELERGEN is a powerful, multi-faceted Cell Therapy treatment system that helps intercept and prevent, repair and maintain, rebuild and rehabilitate, the cells in our body, and it does so irrespective of your age and effortlessly. CELERGEN is clinically proven and potently formulated with Marine DNA Cellular Extracts which are known for supreme rejuvenative, regenerative and anti oxidant properties. It offers you immense energy, enhanced vitality and ageless beauty. 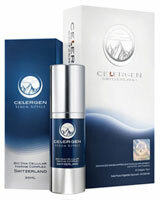 CELERGEN Serum Royale is an advanced anti-aging serum that works directly on your facial skin. It prevents moisture loss and treats invisible, deep seated inflammation; repairs damage by stimulating the turnover of skin cells and boosting collagen synthesis; and maintains the skin's healthy condition. Switzerland is renowned for its ultra high quality standards. 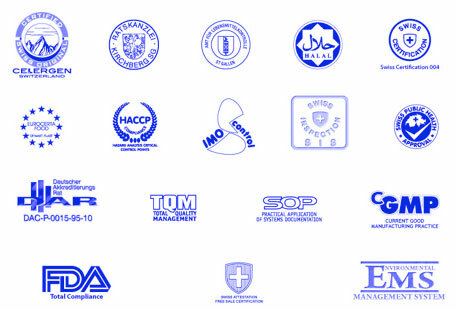 “Made in Switzerland” products serve as a symbol of assurance to consumers round the globe. CELERGEN is manufactured to rigorous Pharmaceutical Grade Standards and produced in the state-of-art FDA inspected facilities. It is guaranteed to be free of toxins, contaminants or low grade ingredients. CELERGEN is an extensively certified supplement with full conformity to International stringent standards of Good Manufacturing Practice, European certifications and Total Quality Management. It is clinically tested by Bio-HC, one of Europe’s largest and most sophisticated Clinical Test Research Centres in Pessac, France under Good Laboratories Practice conditions. Bio-HC comprises professional which includes physicians, pharmacists, dermatologists, allergologists, biochemists and bacteriologists. CELERGEN is a nutritional supplement not a drug. One of its key ingredients is a proprietary Cellular Marine Complex that is extracted from the DNA of deep-sea marine life, which through nearly 30 years of research has been associated with powerful anti-aging properties. Other ingredients include Peptide E Collagen, which reinforces skin elasticity, and Hydro MN Peptide, which plays a critical role in the rejuvenation of cartilage. Regardless of your age, you can now relish your life with renewed energy incorporating CELERGEN into your healthcare regime. Just 4 weeks of usage will demonstrate outstanding and extraordinary results in dramatically arresting the aging process, leaving you to enjoy your life with perpetual vitality, joy and youthful beauty. “After taking Celergen, my eyesight has improved, I'm now full of energy and can go on long walks, and can cycle for longer distance. 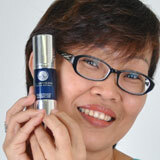 My complexion is more youthful now and everyone says I don't look like a 75 year old lady!" "I just wanted to tell you that in the last 10 days, 4 people have said that I look so well and have become more beautiful over the years. I 100% would like to give the credit to Celergen!!! I have been taking Celergen for one month and I myself thought that my skin is looking softer, smoother... And the others have apparently confirmed this by saying I look so well... Thank you so much for this beautiful gift!!" "My overweight condition has worn out my knee cartilage over the years, resulting in excruciating pains whenever I tried to walk. My daughter recommended Celergen to me. After 4 months, I'm so pleased that my knee condition has improved tremendously. I'm now able to walk to the market and shopping centre with my husband, something which I had not been able to do for a long time. Celergen has also helped to stabilize my high blood pressure and my recent health check showed that most of the health indicators are within the normal range. I feel much better and healthier overall. My weight has also come down by 15kg since I started Celergen 15 months ago." "When I first started on Celergen, my objective was to reduce stress on the hectic lifestyle and improve my immune system. After 3 months of use, I'm impressed with the improvement to my skin complexion. Even my hubby also said that his skin complexion looks much better now. Recently, I accidentally scalded my hand while baking over the oven and to my surprise, the recovery was very fast. I feel that my skin cells are back to when I was 20 years old again. Cheers to Celergen!"